Text: John 15:5-7 and John 14:1-7 (verso). 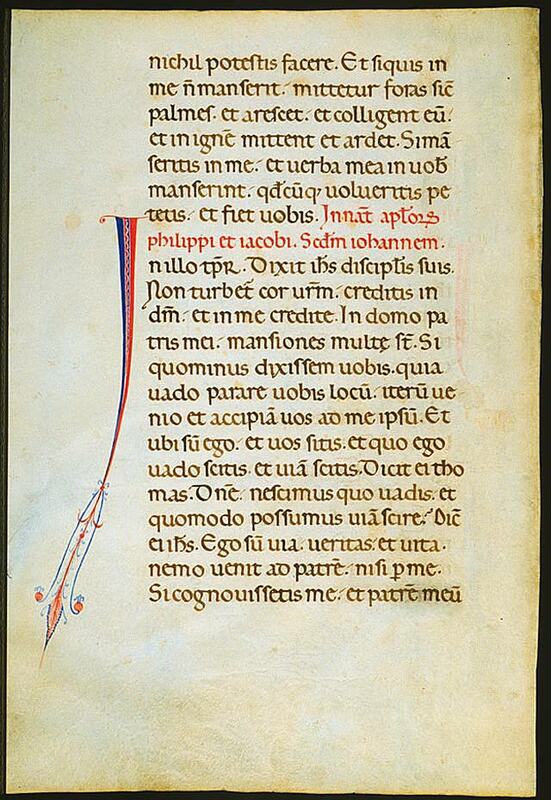 A scan of the recto of this leaf is currently unavailable. nihil potéstis fácere. Si quis in me non mánserit, mittétur foras sicut palmes, et aréscet, et cólligent eum, et in ignem mittent, et ardet. Si manséritis in me, et verba mea in vobis mánserint, quodcúmque voluéritis petétis, et fiet vobis. ...you can do nothing. 6 If any one abide not in me, he shall be cast forth as a branch, and shall wither, and they shall gather him up, and cast him into the fire, and he burneth. 7 If you abide in me, and my words abide in you, you shall ask whatever you will, and it shall be done unto you.